Michael Lanier Staff Partner at michael.lanier@cancer.orgDay of Volunteer: Do you want to help out at a Relay event but don't have time to commit to a leadership role or a team? No problem. We always need helping hands the day of the event. Tents need to go up, Luminaria bags need to be lit at night, funds need to be collected and counted. There are many small ways to help out that make a huge difference. Logistics(10-15 Volunteers needed, Times Varies): Setting up signs, banners, marking campsites, helping teams unload their supplies and set up tents. 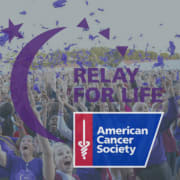 Survivor Area (10-12 Volunteers needed, Time: 4:00pm-8:00pm) Help needed to set up and serve our local Survivors and Caregivers at the survivor reception. We also are needing help with games and activities for Survivors. Children's Zone Area: (5-10 Volunteers needed, Time: 5:00pm-9:00pm): Help needed to set up and man the Children's Zone. From manning bounce houses to crafting with children of different ages.